Conservation of Box Gum Grassy Woodlands on the North West Slopes of NSW is best achieved through on-farm management of high quality remnant patches. Pasture utilisation is widely regarded as a key driver of profitability for the red meat and wool industries in southern Australia (Lodge et al. 2012). 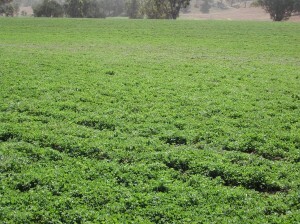 On-farm, this means increasing animal intake of green pasture growth. Using more of the green pasture grown throughout the year is often the most cost effective way to lift the productivity of a grazing enterprise. However, in grazing systems having a constant stocking rate, little attempt is made to increase intake in response to increased pasture growth within seasons and between years and so pasture utilisation is traditionally low. 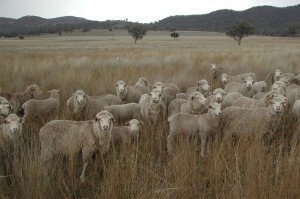 This situation often occurs in northern NSW, where native perennial grass-based pastures are dominant, and tend to be stocked year-round at about their winter carrying capacity, and under utilisation is manifested by the carryover of a large amount of dead standing material from year to year. Survey results (Lodge 2011) indicated that climate variability and droughts (as opposed to climate change) were major issues for producers for both profit and natural resource management (NRM). An analysis of annual weather records (1882-2004) for Barraba indicated that although the mean annual rainfall was 692 mm it ranged from 326 to 1174 mm/year and was on average 99 mm higher in the second half of the last century compared with the first half. However, there is little documented information in this region on past climate variability and its likely effect on animal production. This study used pasture and livestock modelling to demystify the concept of pasture utilisation and so provide benchmark values for different pastures and livestock enterprises to increase profitability. Full details of the modelling, results and recommendations are provided in the key message: Variable climate, flexible approach. Lodge GM (2011) Surveys of grazing industry end-users in northern New South Wales. In ‘Proceedings of the 26th annual conference of the Grassland Society of NSW’. (Eds G Lodge, W Wheatley, J Scott). pp. 107-110. (Grassland Society of NSW Inc.: Orange). Lodge GM, McCormick LH (2010) Long-term annual rainfall and the distribution of simulated annual pasture intake of ewes grazing different pastures on the North-West Slopes of New South Wales. In ‘Proceedings of the 25th Annual Conference of the Grassland Society of NSW’. (Eds C Waters, D Garden). pp. 123-126. (Grassland Society of NSW Inc.: Orange). Lodge GM, Johnson IR (2008) Using modelling to explore the relationships between predicted long-term stocking rates and sheep intake of pasture and supplement for a native perennial grass-based pasture near Barraba, NSW. In ‘Proceedings of the 23rd Annual Conference of the Grassland Society of NSW’. (Eds SP Boschma, LM Serafin, JF Ayres). pp. 141-143. (Grassland Society of NSW Inc.: Orange). Lodge GM, Johnson IR (2007) Impact of climate variability on predicted annual pasture intake of sheep grazing native pastures in northern NSW. In ‘Proceedings of the 22nd Annual Conference of the Grassland Society of NSW’. (Eds D Garden, H Dove, T Bolger). pp. 54-55. (Grassland Society of NSW Inc.: Orange). Lodge GM, Johnson IR, McCormick LH (2012) Pasture utilisation – a key driver of profitable grazing. In ‘Proceedings of the 27th annual conference of the Grassland Society of NSW’. (Eds C Waters, C Harris, G Lodge). pp. 116-119. (Grassland Society of NSW Inc.: Orange). MLA (2011b) More Beef from Pastures Manual. Module 4- Pasture Utilisation.